Lies, damn lies and Cornwall Council statistics | Cornwall – a developers' paradise? In arguing for their population growth strategy Cornwall Councillors have made a number of assertions based on statistical evidence. Let’s investigate two of them. Edwina Hannaford, Lib Dem Cornwall Councillor and portfolio holder for planning, said on Radio Cornwall on 16th December at 8a.m. that ‘The birth rate in Cornwall is actually outstripping the death rate at the moment’. Now we can easily check this against the tables of annual numbers of births and deaths by local authority of place of residence on the Office for National Statistics website. And this is what we find. It looks as if Cllr Hannaford isn’t very up to date with her data. In 2011 there were indeed 145 more births than deaths, but in 2012 this was reversed and the gap widened further in 2013 to a net natural population decline of 465. So who fed Cllr Hannaford her data? And why didn’t she bother to check its accuracy, something that would have taken her less than five minutes? The second curiosity in the world of Cornwall’s planners is the statistic the Council’s leading lights are keen to repeat at every opportunity – that less than 1% of Cornwall’s land surface is ‘used for housing‘. Unlike the birth and death data, which are just wrong, this is a factoid, in the sense of being ‘a briefly stated and usually trivial fact’. It’s technically true but there’s something very, very odd about it that undermines the image the Council wishes to convey when they wheel it out. The source for what supporters of high housing growth think is their killer fact is the Generalised Land Use Database (GLUD) of 2005. This does indeed inform us that of 3.6 million square meters of Cornish land surface (some of that being water), only 22,464 square meters (or 0.62%) are accounted for by the ‘area of domestic buildings’. Councillors have played fast and loose with this one. Take Councillor Andrew Wallis’s blog of 24th November. He confidently stated ‘that ‘currently roughly 1% of Cornwall has development‘. This is not at all the same thing. He is mischievously misleading his readers as he makes his point as part of an argument that the Local Plan is not ‘concreting over’ Cornwall. The clear implication is that the other 99% of Cornwall is not developed, which to most people would imply green fields and countryside. Sadly, this is not the case. We have to add a few little things to the GLUD statistic for ‘area of domestic buildings’ to reach the total of ‘developed land’. Things such as other non-domestic buildings, shops, offices, public buildings, roads, car parks, domestic gardens, industrial land, clay tips and the like. Suspicions about this claim of 1% should also be raised by the illogical mathematical reasoning that accompanies it. Cllr Wallis tells us that building 47,500 more houses will raise this 1% to 1.5%. Now that’s a 50% rise in the built up (with houses) area. But 47,500 houses adds around 20% to Cornwall’s housing stock of 2010, not 50%. So is Cllr Wallis suggesting that a 20% increase in houses will lead to a 50% increase in the land they occupy? Either they’re going to be bleddy huge houses or something or someone here isn’t adding up. In fact, if we add 47,500 houses pro-rata it should increase the area covered by houses alone from 0.62% to 0.74%. The fact that Cllr Hannaford makes the identical elementary error suggests that these half-baked statistics were fed to councillors by their officers and then only half digested. It’s a pity that neither Cllr Wallis nor Cllr Hannaford asked those officers for the source of the data and then spent a few moments quietly reflecting on them before rushing into print or onto the radio. A pity too that no journalist seems capable of challenging these statistics. If they had done, they would have discovered a very strange thing. In Plymouth is only 8% of land ‘developed’? From the same GLUD source we can easily work out the areas covered by domestic housing in other regions and local authorities. 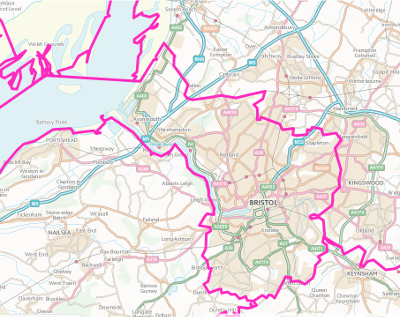 Let’s take Plymouth for example, which most people would agree is an urban local authority. According to these statistics the proportion of land covered by houses in Plymouth is just 7.8%. So apparently plenty of room in Plymouth for expansion. Or what about Bristol? There, the proportion covered by houses is slightly bigger at 8.3%. There must be a lot of fields and countryside there though if 92% is undeveloped. Is only 8% of Bristol ‘developed’? And what about Greater London? There isn’t a vast amount of countryside left in London apart from the royal parks. But the same statistic reveals that the area of London covered by houses is a mere 8.7%. How much of the remaining 91.3% is rural though? Think about it. Is 91% of Greater London really undeveloped or are Cornwall Councillors living in cloud cuckoo land? I queried calculations resulting in amount of housing being built 2 years ago by letter after receiving copy of Bodmin Local Plan. Never received reply so at next public meeting pinned my letter to notice board for all to see where residents put comments. Went again later and it had been taken down so put up again. Also spoke to a planning officer who assured me they would reply, never did. Mentioned not had reply on Radio Cornwall programme still no response because they know the figures do not add up! Many thanks Bernard, interesting calculations making a good point. Must admit, I was surprised that births-deaths in Cornwall was positive (albeit briefly) in recent years. Well done Sue also. If the ratio of houses:land in greater London is about 8%, and Cornwall’s is about 1%, by GLUD, that suggests that the whole of Cornwall is an eighth as built up as Greater London. A new slogan for Visit Cornwall (!)? Looking ahead – is there any reasonably simple measurement which expresses ‘reality’ (from GLUD or other source) which you think could be used objectively when discussing facts of planning, when people discuss planning politics ? i.e. If there were a 1-side-of-A4, “Foolproof Guide to Briefly Discussing Planning – Fairly, Honestly, Accurately and Concisely” , any ideas on what measurements it would recommend, and in which ways they should be used to describe things ? Pingback: Corporate Local Plan adopted: dismal day at Lys Kernow | Cornwall – a developers' paradise? Pingback: The myth of ‘developed’ land: the false facts roll on | Cornwall – a developers' paradise? Pingback: How did we get into this mess? : 7 Preparing to submit, the winter of 2013/14 | Cornwall – a developers' paradise? Pingback: How did we get into this mess? : 11 Conclusions | Cornwall – a developers' paradise? Pingback: New land use data puncture myth of ‘deep rural’ Cornwall | Cornwall – a developers' paradise?